Where is my Gingerbread Man? Oh where, oh where is my Gingerbread Man? He popped out of the oven and ran out the door. Draw pictures of gingerbread people and cut them out. Make them into puppets by taping them to popsicle sticks or straws. Put on a puppet show about your gingerbread people. Do you leave Santa gingerbread cookies on Christmas Eve? 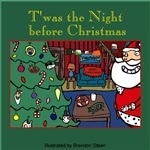 Read 'Twas the Night Before Christmas by Clement Clarke Moore; illustrated by Brandon Steen.